Create a beautiful private sanctuary by using FenceFacade™. This natural looking barrier keeps pools, backyards, work areas and construction sites private. A variety of popular artwork is available from our vast library of outdoor scenes, or you can customize it with your own artwork or photography. Panels come in 10 ft. lengths at various heights for all types of fences. Our FenceFacade™ is manufactured of a durable gauge vinyl material, easy to install and maintain, and is removable and interchangeable. 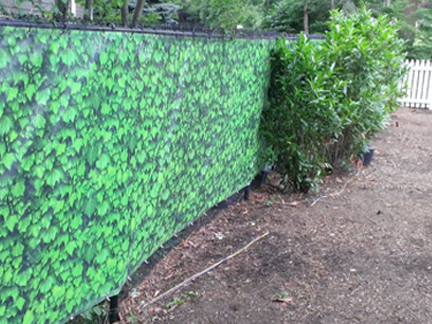 It can be used on existing and new fence installations.